No. 37. Ava. Tower of the Palace. bl.uk > Online Gallery Home	> Online exhibitions	> Asia, Pacific and Africa Collections	> No. 37. Ava. Tower of the Palace. Photograph by Linnaeus Tripe of a watchtower at Ava (Inwa) in Burma (Myanmar), from a portfolio of 120 prints. Tripe, an officer from the Madras Infantry, was the official photographer attached to a British diplomatic mission to King Mindon Min of Burma in 1855. This followed the British annexation of Pegu after the Second Anglo-Burmese War in 1852. Aside from official duties, the mission was instructed to gather information regarding the country and its people. Tripe's architectural and topographical views are of great documentary importance as they are among the earliest surviving photographs of Burma. 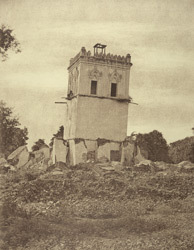 Tripe described this view of the Nanmyin, a square brick and stucco watchtower, tilting and surrounded by fallen masonry, 'This is the only coherent remains of the palace. The earthquake of 1839 covered the ground with the rest of it and tilted this considerably'. Ava, located south-west of Amarapura at the confluence of the Irrawaddy (Ayeyarwady) and the Myitnge rivers, was founded in about 1365 as the third capital of the Shan rulers previously established at Pinya and Sagaing. For the most part of the next five centuries it remained the royal city until finally abandoned as capital in favour of Amarapura. Much of Ava including the 19th century palace of King Bagyidaw at its centre was destroyed in a disastrous earthquake in 1838. The Nanmyin is all that remains of the palace although the upper part of this 30 m high masonry tower was destroyed. The lower part leans to one side, earning it the nickname of 'the leaning tower of Ava'.